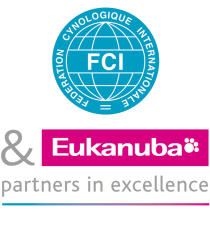 Passion for purebred dogs is at the heart of both the FCI and Eukanuba, and in February, 2014 the two organisations announced the continuation of their joint efforts with the signing of a new 3-year ''Partners in Excellence'' agreement. The Finnish Kennel Club started its care dog activities, where volunteering dog owners visit groups of people with special needs, in the year 2001. Care dogs are ordinary family dogs owned by laymen wishing to bring joy and warmth to the life of those who really need it. The shows in Norte took place, as usual, in the Exponor Fair Grounds on 17-18 January. Inspired by wonderful initiatives carried out by several FCI members all over the world (see references below), the FCI suggested a meeting with Mrs Michelle Dutrieux, General Director of the City of Thuin, and Mr Luc Caron, Director of the local nursing home Le Gai Séjour. by Prof Giovanni Morsiani, President of the Technical Academy of the International Saint Bernard Forum and Teacher of Cynognostic, University of Bologna, Italy. Lithuania is a fairly young member of the FCI and the European Union. For this reason cynological culture is still developing in our country. Therefore, we are happy to create and promote new things as they are always inspiring. It was a privilege and honour for The Malaysian Kennel Association (MKA) to have our FCI President Mr Rafael de Santiago, officiate the opening of our newly renovated offices on 20th January, 2014. Do you think you provide your dog with well-being and health? The dates were 23-26 January 2014. This was the biggest show the Philippine Canine Club had organised in its 51 years of existence. 1890 - First show in Holland restricted to non-sporting dogs, was organized in Scheveningen with 295 entries.